Whichever type of tyre you decide upon ensure that the pressure stays within the maximum and minimum stamped on the side of the tyre wall. If you are constantly getting punctures try increasing the tyre pressure, this will allow the tyre to repel sharp objects. You should never exceed the maximum stated pressure. An essential part of your bike! 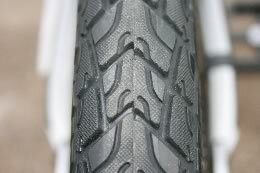 Your tyre is an essential part of your bike if it is worn or cracked you should replace the tyre before use, your local bike shop will be able to help if you have problems. 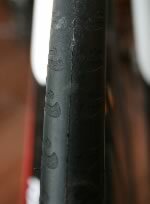 These tyres are for people who put a lot of mileage on their bikes. They are fairly heavy, but last longer; manufacturers say 1000-2000 miles, but the actual mileage varies depending on how you ride, your weight, and if the tyre is on the front or back. Expect to pay anywhere between £15 and £30. Hybrid bicycles land somewhere between a road bike and a mountain bike and hybrid tyres are also somewhere in between. They often have a dual tread, a smoother pattern in the middle to reduce rolling resistance and a rougher pattern on either side of this to add stability on dirt or loose surfaces. Width of hybrid tyres ranges from 25-40 c. You can put them on your road bike depending on how much clearance you have around your brakes and forks. Expect to pay around £20. Mountain bike tyres have thick, knobbly treads that are designed to grip in mud and off road obstructions such as rocks and tree routes. The tyres are usually a lot wider and hold a greater volume, this is to cushion the ride and allow them to grip in difficult conditions. 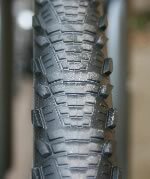 Because mountain bike tyres have thick knobbly treads the rolling resistance is considerably higher and therefore are not suitable for great mileage on the roads. 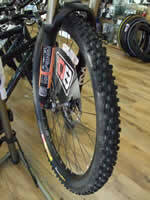 If you are using your mountain bike to commute for example it is well worth considering a tyre change. Expect to pay anywhere between £15 and £40.